"This is a great pork recipe. Mustard is a classic with pork, but when you add the extra zing of horseradish and cayenne, and then smooth it out with a little cream and butter, well, it's devilishly delicious." Preheat oven to 375 degrees F (190 degrees C). Season pork with salt and pepper. Heat oil in an ovenproof skillet over high heat. Cook pork until browned on one side, 3 to 4 minutes. Turn over pork and transfer the skillet to the preheated oven. Cook until pork is browned and still slightly pink in the center, 20 to 25 minutes. An instant-read thermometer inserted into the center should read at least 145 degrees F (63 degrees C). Transfer pork to a plate. Remove any excess oil from the skillet and place it over medium-high heat. Pour in chicken broth and bring to a boil, scraping any browned bits off of the bottom of the pan. Whisk in cream, horseradish, Dijon mustard, and cayenne pepper. Continue cooking until the mixture is reduced to a thick sauce, 3 to 4 minutes. Remove from heat and whisk in cold butter. Stir in chives. Slice pork into 1/2-inch slices and serve topped with sauce. 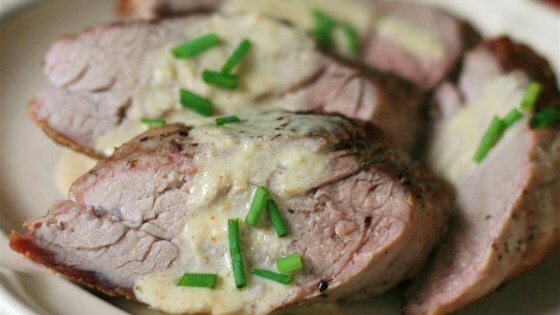 See how to make quick pork tenderloin in a spicy cream sauce. I love this method for cooking the pork. Be careful with the salt on the meat though - between the salt on the meat and the salt in the broth & mustard it left the sauce too salty. Everyone raved about this recipe. I'm just now realizing that I didn't add the butter or chives at the end. Not sure how (or if) that would have changed the results but we loved it. How can you go wrong with Pork and Mustard? This recipe just puts it over the top. One of our favorites, and part of the regular rotation.